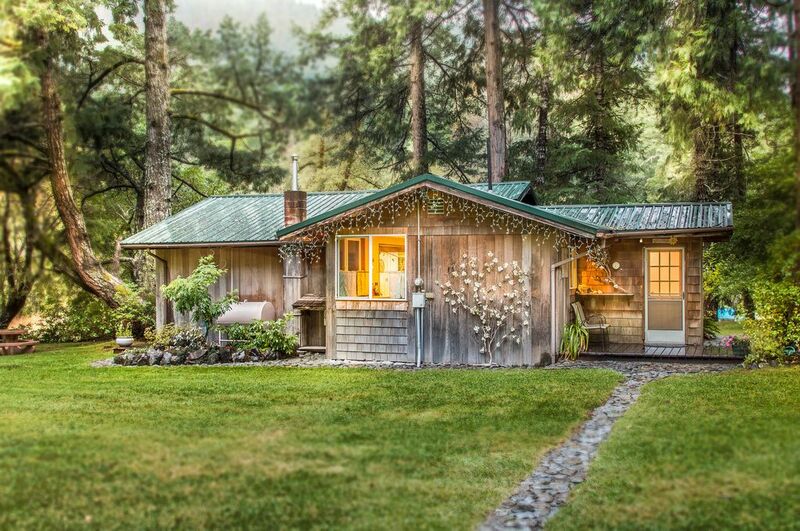 Our cabin is located 17 miles from Crescent City off of Highway 199 in a quiet secluded country setting. You can either walk or drive in to the property. We are surrounded by the Smith River National Recreation Area. Our cabin overlooks the river, an organic garden, and large lawns. The Smith River is one of the largest undamed wild and scenic watersheds in the United States. Unparalleled in beauty and tranquility. Solitude and pristine, natural settings can be found throughout the area. Over 65 miles of trails give access to the botanical areas, forested ridges, craggy peaks, grassy meadows, scenic rivers, and mountain lakes. The spectacular Northern California coastline is only 20 minutes away. We have lived in Gasquet since 1987, and love the area. We take pride in our properties and are responsive to any of our renters needs. Since we are local, we deal with our guests directly – from key exchanges, to cleaning, to repairs, and anything in between. All of our properties are fully furnished and have all the amenities of home! We loved our visit to the Northern California coast and the Redwoods! After our rainy adventures in the surrounding forests we came home to a cozy house and a warm hot tub! Kris and Mike were delightful and warm! We visited during a rainy week and didn't spend much extra time in the yard but we loved all the open space, pigs, chickens, geese, the river - it was the perfect place for us! We loved this little cabin by the Smith River. We traveled out from Ireland for steelhead fishing, I had booked the Raven’s Nest via the internet, hoping it would be just what we wanted, quiet, secluded, and when we arrived for our 14 day stay, we were delighted to find everything better than expected. The place was well stocked with cooking essentials, as well as pots and such. We cooked everyday, and the drive into Crescent City every few days for supplies wasn’t a bother. There are two nearby small grocery stores, but for a real selection you do need to go into Crescent City, but again, it’s a short drive and not a bother. My wife, sister in-law and I stayed here for two nights while exploring the surrounding area and found it to be exactly what we needed. The property is amazing and we value the opportunity to stay in such a place. Rather than using the footbridge, we ended up driving in and out via the forest service road. We found it to be quite accessible with our AWD Honda CR-V but can see the property owner's concern with two wheel drive vehicles. Wonderful place to get away. The property is cozy and well maintained. The grounds are well taken care of and the setting is beautiful. If you choose to drive in, instead of using the cable bridge, you will be on logging roads and it requires a little patience. We drove in without incident, but I have a 4x4 truck. The cabin is well appointed and the kitchen has most of the utensils you will need. We had a relaxing weekend and wouldn't hesitate to return.